When life prevents you from going out and adventuring, you make your own adventures at home. My latest adventure is making sourdough. Now, I could go out and obtain or buy a starter from a local bakery, but what’s the fun of that? It’s so easy to start my own from scratch, and now I have one that I can truly call my own. My guide for making the starter and baking my first batch of bread comes from King Arthur Flour’s Sourdough Baking Guide. This all started about 3 weeks ago. I had some whole wheat flour sitting around and wasn’t sure how well it would start, given its age. But I mixed up the 1 cup of flour and half-cup of water and let it sit overnight and sure enough, there wasn’t much activity. But that’s normal. I fed it, and on day two, there were bubbles. Success. So I kept feeding it. Third day, more bubbles, and a ripe odor. Fourth day, still going strong. It was time for two feedings a day. But my starter was growing big. Ooops, I misread the instructions and threw out half a cup each day instead of saving half a cup. So I switched to that motif, keeping half a cup and feeding it, discarding the rest. Activity stopped. It no longer tasted tangy, nor smelled of fermentation. I kept feeding it anyway, hoping it would recover. It didn’t. It wouldn’t rise. Was it too cold? Did I screw something up by not properly feeding it originally? Probably not, but I also wanted to ensure success. So I dumped it and began again. Adventures in Sourdough, take 2. When baking, it’s important to get your flour to water ratios right or the dough won’t have the right consistency. I had been measuring my flour and water and starter by volume, which is not really an accurate gauge of how much material I was working with. So I ordered myself a kitchen scale. It arrived and this time I was determined to be more precise. Now I doubt that measuring by volume caused my previous attempt to flop – yeast and bacteria are both hardy creatures, and altering the moisture content can favor one over the other to control the flavor and intensity of your starter. But I was determined to be a bit more precise and deliberate in my measurements. I weighed out 113g of whole wheat flour, and 113g of water, mixed it together and let it sit overnight. Again, no activity, but with a feeding of 113g of starter, 113g of flour, and 113g of water and another 24 hours of rest, the starter was on track just as before. I also decided to incubate the starter in the oven with the light on for a few hours, just in case room temperature on top of the fridge wasn’t in the ideal range. By day 4, it was starting to rise, and by day 6, it was consistently doubling in volume. In fact, it liked that environment so much that one day it overflowed the jar. I guess it’s a little too warm in the oven. Friday night, I came home from game night and fed the starter, but instead of keeping the 113g, I expanded each ingredient to 200g so I’d have a total of 600g of starter in the morning – 113 I’d take out to continue culturing, and the rest I’d use to make bread. I followed the Naturally Leavened Sourdough recipe. To me, breadmaking is zen. There’s a certain satisfaction that comes with mixing the flour and water, kneading, watching it rise, shaping the dough, and tasting the fruits of your labor. I love making pizza for the same reasons. But pizza is cakewalk compared with bread. It doesn’t require as much kneading, only rises once, and you’re stretching it out to put in the oven with the intent of it cooking flat. With bread, you want a rise, and I was pleasantly surprised when my dough rose during each of the resting periods. My natural yeast culture was alive and well and doing its job. But there is still much to improve. I shaped the bread in bowls because I don’t own a proper bread shaping basket. I mean, a proper basket isn’t really necessary. But in the past, I would shape my loaves and let them rest on the counter, and without the support of the bowl, they would eventually spread out as the gluten relaxed, and when it was time to put them in the oven, they wouldn’t rise upward nearly as much as I wanted them to. When shaping a loaf in a bowl, the bowl is often lined with a floured cloth. I grabbed the least-textured cloth towels we had, floured them and lined the bowls before dropping the dough in. At the end of the rise, I dumped the dough out, but it stuck to the towels. I mean, really stuck. I’m still trying to get dough out of them. Grr. The loaves deflated and I was pissed. Bummed. I wasn’t sure what to do. So I tried just greasing the bowls and dropping the dough in after reshaping them. I gave them another 2-hour rise and they came out just fine. Unfortunately, they deflated a bit upon scoring and the loaves didn’t puff up so much as out during baking. Now, let me just say that the bread came out of the oven smelling like heaven. After cooling, I couldn’t resist a taste. By all accounts, I think I had success. I had bread, and it tasted great. So it didn’t balloon up all big. So it’s not quite shaped right for any kind of sandwiches. Toast it up with some butter and it goes well with soup, or just on its own. In fact, even though these loaves weren’t ideal for sandwiches, I still stuffed cheese between two slices and grilled them up for the best damn toasted cheese sandwich I have ever made. God, it was heavenly. I made that for breakfast yesterday with two eggs on the side. I had another one this morning for an early lunch. 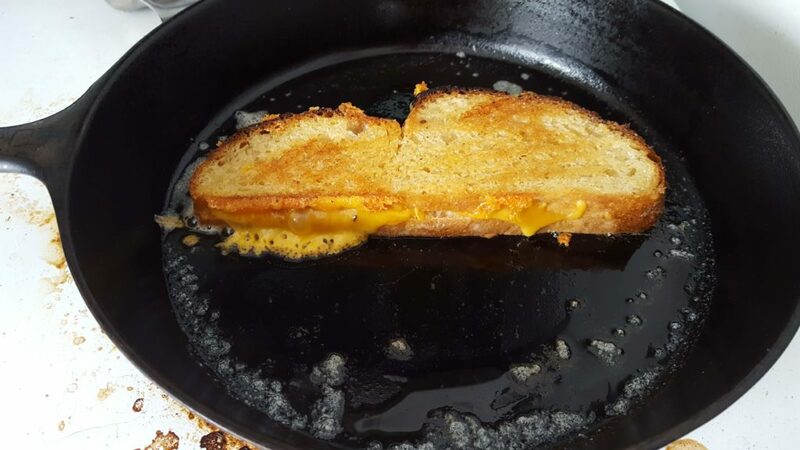 Making a grilled cheese with my sourdough. My starter is now living in the fridge where I only have to feed it once a week. I don’t think I’ll be making bread on the regular, maybe every 2 weeks or so, though there are some recipes I’d like to try that use the discard from each feeding. For my next loaf, I may go with a no-knead recipe in which the entire gluten formation process occurs slowly through a process called autolyzation. I also need to work on getting that bread to hold its shape and rise properly in the oven. Some sources suggest the problem stems from letting the dough over-proof during the shaping stage. It rose too much and thus deflated when removing it from the bowl and scoring it. I might also shape it, or just bake it in a sandwich loaf pan just so I have bread that I can make sandwiches with. 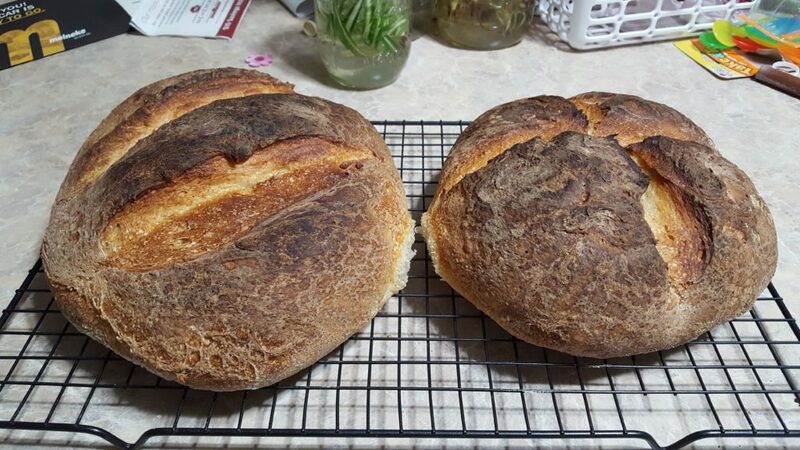 For now, I have made my first steps into the world of sourdough baking, and I’m eagerly looking forward to mastering the art of breadmaking.